While you may not be familiar with what a chalazion is, many people suffer from chalazia in their lifetime. There’s a good chance that you may have experienced the condition too. Chalazia are similar to the styes that you can get in your eye, although there are some key differences. Chalazia are small cysts that develop on the eyelid. While eye styes are often painful and may have you running for home remedies for stye, chalazia are usually painless and can sometimes be ignored. However, when they become enlarged, chalazia can cause discomfort and problems with vision. Chalazia are also quite large compared to styes. They often appear as a large eyelid lump, and may be accompanied by eyelid swelling and discharge. While a chalazion is not a very dangerous issue, it can be annoying and you will likely want to treat it to avoid discomfort. In some cases, the inflammation can spread to your eyelid’s surrounding area. Any habits that may contribute to chalazia, such as rubbing your eyes. Even though the condition is not usually serious, you likely want to know how to reduce a chalazion. The condition can be annoying, unsightly, and potentially dangerous if it’s causing problems with your vision. Luckily, there are plenty of chalazion treatments without surgery, medication, or other major interventions. In fact, you can do a chalazion treatment at home using a variety of natural remedies and treatment options. There are many natural treatments for eyelid pimples, and some that are particularly good for chalazia. One of the best ways to clear chalazia is by using a warm compress over your eyelids. Warm compresses can help loosen your oil glands, clearing debris and allowing for more drainage. They also help increase blood circulation in the affected area. Furthermore, warm compresses can help reduce the pain, swelling, and inflammation associated with chalazia. Simply soaking a clean rag in hot water, wringing it out, and holding the rag over your eyelids for five minutes at a time can help cure chalazia and speed up recovery. To help drain your oil glands, a gentle eyelid massage can be used. Massages improve drainage and promote quicker healing. After doing a warm compress, you can gently massage your eyelids using an upward motion. Doing this for a few minutes at a time throughout the day will encourage faster healing of chalazion. Be sure not to put too much pressure on the chalazion, or you could cause further inflammation. Acacia leaves have anti-inflammatory effect and can help fight off infections. When used in combination with a warm compress, they can be particularly effective. Boil a handful of acacia leaves and then soak a cloth in the water. Using that cloth for your warm compress will fight off inflammation, helping reduce swelling. Guava leaves are not only anti-inflammatory, helping reduce swelling and pain, but they also promote faster healing. You can actually use the leaves on your eyelids. Simply wash a guava leaf, heat it up (a few seconds in the microwave will suffice), and then wrap it in a dry cloth. You can drape this cloth over your eyelid and hold it there. You can repeat this throughout the day. Castor oil is anti-inflammatory and can also reduce the size of an eyelid cyst. Castor oil can be applied directly onto a chalazion. After a warm compress, use a cotton swab to dab castor oil onto the cyst. You can do this twice daily to speed up healing. Apple cider vinegar has a lot of benefits for different conditions, and it can help cure chalazia too. Apple cider vinegar is anti-inflammatory, antiseptic, and fights pain and infection. Take two teaspoons of apple cider vinegar and mix them in a cup of hot water (or room-temperature water). Dip a cotton ball into the mixture, then apply to the cyst. Apple cider vinegar can be applied up to three times daily, and will help ease discomfort while reducing swelling. Green tea is known for its anti-inflammatory properties. What you may not know is that you can use a green tea bag as an effective, inflammation-fighting warm compress. Simply leave the green tea bag in warm water for a few minutes, remove, wring out any excess water, then hold the moist bag over your eyelid. Don’t rub your eyelids or touch your eyes with unclean hands. Use a warm compress regularly, preferably just before bed. If you suffer from chalazia repeatedly, use baby shampoo to clean your eyelids daily. 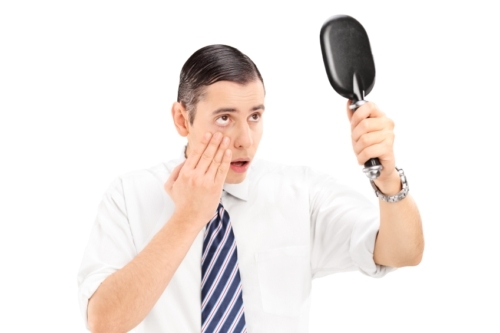 Use eyelid massages if your eyelids begin to feel slightly swollen, teary, or inflamed. As a last resort, certain medications can be useful for preventing chalazia. So take the right steps today to keep your eyelids clean, healthy, and cyst-free! Bixler, J.E., “Chalazion,” Kellogg Eye Center web site; http://www.kellogg.umich.edu/patientcare/conditions/chalazion.html#causes , last accessed March 14, 2016. “Chalazion,” American Optometric Association web site; http://www.aoa.org/patients-and-public/eye-and-vision-problems/glossary-of-eye-and-vision-conditions/chalazion?sso=y#2, last accessed March 14, 2016. “Chalazion,” Healthline web site; http://www.healthline.com/health/chalazion#Overview1, last accessed March 14, 2016. “Effective Natural Cures for Chalazion,” EarthClinic web site, March 8, 2016; http://www.earthclinic.com/cures/chalazion.html, last accessed March 14, 2016. “Home Remedies for Eyelid Cysts (Chalazions),” Top 10 Home Remedies web site; http://www.top10homeremedies.com/home-remedies/home-remedies-for-eyelid-cysts-chalazions.html, last accessed March 14, 2016. Pham, Hang, “Top 11 Home Remedies for Chalazion Cysts,” VKool web site, June 2, 2015; http://vkool.com/home-remedies-for-chalazion/, last accessed March 14, 2016. “Styes and Chalazia – Topic Overview,” WebMD web site; http://www.webmd.com/eye-health/tc/styes-and-chalazia-topic-overview, last accessed March 14, 2016.